Jet Airways today announced expansion of its domestic network, adding 144 new weekly flights comprising both non-stop and one-stop services as part of its summer schedule, which begins later this month. The new services include flights to north-eastern cities of Imphal and Jorhat as well as Tiruchanapalli in the south from New Delhi and Mumbai, Jet Airways said today. As part of the new schedule, Jet Airways will strengthen connectivity to the north eastern region from the national capital with non-stop services including thrice-a-week flights to Aizawl and Jorhat and four times-a-week flights to Silchar from New Delhi, it said. The airline will also commence four times-a-week non-stop service to Imphal from Delhi, and will launch new non-stop services to Patna, Raipur and Chandigarh. Additionally, Jet Airways will begin a daily, non-stop service for the very first time between Mumbai and Tiruchirappalli, Tamil Nadus temple city and a religious centre, besides a new direct service between Tiruchirappalli and Delhi. "Our summer schedule has been designed with a combination of new services - non-stop as well as direct flights - between emerging cities, key metros and our hubs in Mumbai, Delhi and Bengaluru," the companys senior vice president for network planning and revenue management Raj Sivakumar said. The airlines is also commencing direct, one-stop services between Mumbai and the north eastern cities of Jorhat and Imphal, marking its return to the Manipur capital. Imphal will also be connected with Pune with direct flights through Guwahati and Kolkata, enhancing access and connectivity between the north-east and its hubs in Mumbai and Delhi, according to the release. Giving pet owners a reason to rejoice, Jet Airways will become the third airline in the country with a facility to transfer pets as cargo. Jet Airways had the facility earlier but stopped the service in June 2017 owing to issues. Airline officials said that there is a lot of demand to transfer pets.Currently, Air India and SpiceJet offer pet transfers. Pet owners and relocation centres have welcomed the move. The number of pet transfers has been increasing by 30% annually over the last two years. Passengers wanting to relocate their pets will however be able to book them only on direct flights. While cost of a pet transfer varies and depends on the size of the animal, the space they occupy, the cost of a crate which is purchased by the owner and the travel distance. On an average, a small-sized pet transfer costs around Rs5,000 while the transfer of a large animal like a Labrador dog costs around Rs12, 000 to Rs14,000 that excludes the cost of a crate, which is not less than Rs12,000 for a large animal. Didn't 9W just have to withhold paychecks? Suprised they're ordering so many planes while under such a cash crunch. GECAS has committed to leasing 12 Boeing 737 Max 8s to Jet Airways, with deliveries commencing in June and continuing through to 2020. The lessor says that six of the jets will come from its own orderbook, with the other six to be acquired through sale-and-leaseback transactions with the carrier. The deal was announced just over a week after Jet confirmed an order for an additional 75 737 Max aircraft. It also had 54 737 Max 8s on order from a commitment made at the 2015 Dubai air show. Jet Airways earlier this month expanded codeshare partnership with ANA, covering the latter’s service to/from Tokyo Haneda. Approximately from 10APR18 (or earlier), planned new codeshare routes as follow. Economy and Premiere guests of Jet Airways, an international full service airline, can now experience the next level of the airline’s acclaimed in-flight service, following the launch of the carrier’s latest initiative – JetUpgrade. The innovation - an industry first - allows all guests holding confirmed Economy or Premiere bookings of the airline to bid for an upgrade to Premiere or First Class respectively, for an unmatched flying experience. Launched in collaboration with PlusGrade, which works with leading global airlines, ‘JetUpgrade’ has been made available across the airline’s entire network of 65 domestic and international destinations, and on all flights operated by it. Just got a mail from Jet Airways, signed by Mr Goyal, informing me that the first Jet Airways flight took off from Mumbai Airport bound for Ahmedabad, at 5.50 AM, on the 5th of may 1993 - exactly 25 years ago! My word, where they have reached! From a single 737-300, 25 years ago to 116 aircraft today, and from a handful of destinations in India to over 450 all over the world, combined with their partners! 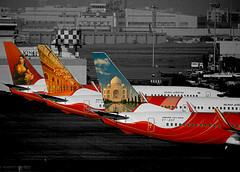 Whatever one may say, Jet Airways is one of the iconic Indian brands that is now recognised worldwide. Their service too, while not top-notch, is definitely very good and is a lot better than many of their competitors. So Happy Silver Jubilee Birthday, Jet Airways. You definitely have made India proud. Wish you a great future full of even greater achievements. Jet Airways today said that the aviation ministry has not approved its plan to merge Jet Airways and JetLite, effectively meaning that the two airline entities would operate under separate Air operator Permit. “The Ministry of Civil Aviation has not approved the Scheme of Merger of Jet Lite (India) Ltd. With the Company, the same stands revoked, cancelled and shall have no effect as provided in para 18 of the Scheme. In view of the above, Jet Lite (India) Ltd. and Jet Airways (India) Ltd. shall continue their respective operations as two separate legal entities with their respective Air Operator Certificates,” the airline said in a filing to the Bombay Stock Exchange. JetLite is a fully-owned subsidiary of Jet Airways that operates a fleet of 8 Boeing 737s, within India. Earlier, JetLite operated with a different brand name, which was called Jet Konnect. But that was discontinued and the airline now operates one full-service brand – Jet Airways. Sources in the know said that the ministry may have rejected the proposal because there is no precedent of airline mergers in Indian aviation. Senior ministry officials could not immediately eb contacted for their version on the issue. Didnt DN and IT merge? How about AI and IC? What BS is this? Huh this does not make sense to me. Not saying there is a legitimate reason, just saying the article's reason of no precedent doesn't fly for me. Jet Airways has confirmed the start of flights from Manchester to Mumbai, with four frequencies a week launching on November 5. The new route means the Indian carrier will claim market leadership between the UK and the city, which is India’s commercial capital and centre of the Bollywood industry. The airline will fly on Monday, Thursday, Saturday and Sunday, offering 254 seats on a two-class Airbus A330-200, including 18 in the airline’s Premiere cabin. Flights will depart Manchester at 09.35, arriving in Mumbai at 00.40. The inbound service will leave at 02.30, arriving at 07.55. Economy fares will start at £400 return. 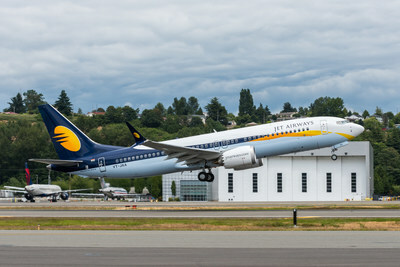 Jet Airways already flies to Mumbai three times a week from Heathrow and will offer onward connections to 44 domestic routes at its hub, plus international routes including Bangkok and Hong Kong. There are an estimated 500,000 people in the north west of Indian origin, but the 130,000 people travelling between Manchester and Mumbai currently have to travel indirectly. India has overtaken China as the world’s fastest-growing economy – with current expansion in excess of 7% per annum. India is also the world’s third most significant economy in terms of purchasing power. Vinay Dube, Jet Airways chief executive said: “We are extremely pleased to begin a new chapter in our decade-long relationship with the United Kingdom. This is great news. BOM-MAN and BOM-SYD should do very well for both leisure and business traffic. 9W also ought to be looking at East Africa and destinations like Mauritius for expansion. Horrible timings especially on the inbound from MAN and not much better on the outbound either. Why should the flight arrive at midnight at BOM. If you are going from MAN to other Indian cities you have spend the night at BOM. There are no connections at MAN either. I am not sure if this will succeed, passengers from outside BOM may continue to prefer ME3. May be slot issues at BOM ? It should be late afternoon departure from BOM and night departure from MAN with arrival at BOM late morning, perfect for connections. Jet Airways India Ltd. is closing in on a new order for Boeing Co.’s 737 Max single-aisle plane that could take its commitments for the model above 200 aircraft. India’s biggest full-service airline is in talks over the purchase and may make an announcement in coming weeks, Chairman Naresh Goyal said in an interview Friday. He didn’t specify how many planes the company aims to buy, though Jet’s previous two orders for the model have been for 75 aircraft apiece. Does 9W have any plans of commencing flight to MEL/SYD any time soon?I haven't come across any such news/rumour/speculation (happy to be corrected ). SIN/BKK/HKG/CMB work well but any flights to Oz would require the MAN passengers to have an overnight halt in BOM OR a day halt in SIN. W.r.t. connecting domestically, I believe 9W already has red-eye services from BOM to a fair few cities around India. DEL, MAA, CCU, BLR, HYD and GOI come to mind. Looks like this flight is well timed for Virgin Atlantic connections at MAN to/fro JFK/ATL/MCO/BGI plus seasonal services between MAN and BOS/LAS/SFO. Jet Airways in late-April 2018 expanded codeshare network in Europe, on flights operated by Air France and KLM. Expanded new codeshare routes include the following. Jet Airways and AeroMexico on 01MAY18 launched reciprocal codeshare partnership, covering service between India and Mexico. Planned codeshare routes include the following. What are the DEL-DAC flights meant to connect to? Seems like they don't connect to 9W's EU flights (just like BOM). Is it just O&D, Domestic and Gulf connections? It connects to the LHR flight from DEL and Gulf flights. Jet Airways in last week’s schedule update filed planned Boeing 737 MAX 8 operation, set to enter operation on 01JUL18. For the moment, the 737 MAX 8 operation is listed for the month of July 2018 only. The inaugural is currently scheduled as Mumbai – Hyderabad 9W457/458 service on 01JUL18, although further changes remain possible. Jet Airways announced restrictions on Friday on the number of bags that a passenger can check in. From July 15, an economy class Jet passenger can check in for free only one bag that weighs 15kg or less, while a "premiere" class passenger will be allowed two free check-in bags, each not more than 15kg. Jet Airways is the first airline in India to introduce restrictions on the number of check-in bags. Jet platinum card members can carry two bags not exceeding 15kg each (30kg in total) when travelling economy. Those travelling premiere have been allowed two bags not exceeding 25kg each (50kg in total). "Jet Airways is revising the baggage concept from weight to piece for sales effective June 15 and travel effective July 15," said a note sent by the airline to travel agents on Friday. Starting June 15, Jet will be moving to "single-bag concept" on flights within India, it added. A senior Jet official said the new rules won't apply to those who bought tickets before June 15. The jet official clarified that the free check-in baggage entitlement hasn't changed. "We continue to provide 15kg of free check-in bag to passengers, only the format of packaging allowed has been changed to include a restriction on number of bags that can be checked in," he added. He said that the restriction on the number of bags that can be checked in has been in place on their international flights for about a year now. What is not clear though is how the airline will handle passengers who don't follow the new rule and bring in more number of bags than is allowed for free. For instance: if an economy class passenger has two check-in bags, say, one weighing 10kg and the other 5kg, will Jet charge a fee for the second bag? Currently, only excess weight attracts a fee. The Jet Airways note to travel agents and frequent flyers did not address this concern. No Jet Airways spokesperson was available for comment. Though a first for an Indian carrier, several international airlines have restrictions on the quantity of checkin bags allowed per passenger. Fewer the number of bags that need to be loaded onto an aircraft, quicker the turnaround time for the aircraft. Also, a restriction on the number of bags that can be checked in frees up space in the belly-hold of an aircraft that can then be used by the airline to carry cargo and earn extra revenue. "On a Jet Boeing 737-800 with 156 economy and 12 premiere seats, limiting economy passengers to one check-in bag and others to two could mean close to 70 bags less to load," said a ground-handling company official. Jet Airways has added a new (and it's first) 737-8MAX to the fleet today, as VT-JAX. Boeing and Jet Airways today celebrated the delivery of the airline's first 737 MAX airplane. Jet Airways will be first Indian carrier to fly the new and improved 737 airplane, which delivers a double-digit improvement in fuel efficiency and improved passenger comfort. Has Jet Airways discontinued mentioning Etihad Partner members in its onboard welcome message? Jet Airways Ltd said on Monday it has agreed with Boeing Co to purchase75 of its 737 MAX aircraft, as the Indian carrier expands to meet domestic passenger demand in the world's fastest-growing aviation market. Jet Airways is likely to commence operations of 737 Max aircraft from early next month, with the first flight to be operated to Hyderabad from here, according to an industry source. The airline, which took the delivery of the first 737 Max last week, is also expected to deploy the latest fuel-efficient plane from US aircraft maker Boeing initially to Abu Dhabi and Dubai besides on domestic destinations such as Bangaluru, Chennai, Hyderabad, Goa, Jaipur Mangalore and Thiruchirapally, the source added. "Jet Airways' 737 Max 8 is likely to take off on July 1, with its maiden flight to Hyderabad from Mumbai," the source said. No PTV's either in J or Y??? 9W has moved to all streaming entertainment on their 737s. If the max is meant for international flights then no PTVs is a mistake. Btw what is up with Indian airlines and their seat fabric choices. AI is beyond weird and now jet with baby blue??? Can’t there be one sedate business airline in India. And given the amount of dust and grime that is unavoidable in India, these seats are all going to have a layer of brown gook all over them in no time. Just look at AI's seats ! Only Spicejet has those easily cleanable rexine type seats. Indigo's seats are dark blue so much of the grime isn't seen. Even the Indian Railways and state transport agencies aren't free from this madness. Earlier all of them used rexine covered cushions which could be cleaned with just one wipe. Now all of them are into light blue fabric which get horribly dirty in no time, and have to be laundered to be cleaned. This means more effort, money and down time involved in cleaning, so the seats are dirty more often than not. AI's fabric choices (red, beige, orange) hide grime well. And there is a lot of that to be found on AI if the plastic cabin and seat fittings are any indication. But that ghastly baby blue on Jet will look filthy in no time. VT-JXB, 9W's second 737-8MAX is enroute India.